Castleoak has been using the timber frame method of construction since 1987 and all their projects around the UK in care home and extra-care supported housing use timber frame as the preferred method of construction. In 2008, Castleoak Timber Frame was set up as a subsidiary company to exclusively supply timber frame components for Castleoak’s care home contracts. “Following the outbreak of a fire which destroyed the above site on Friday 10 September 2010, the following statement has been issued on behalf of Castleoak: This was a very serious incident and we are co-operating fully with the inquiries being carried out by the emergency services. We understand that four arrests have now been made, which confirms initial suspicions that the foul play was the cause. We are very grateful for the commitment shown by the fire fighting teams and police in dealing with the blaze and are very relieved that there were no casualties. We are now turning our attention to all the practical issues which require resolution following such an unfortunate incident and would like to assure all our partners that it is "business as usual". The latest fire statistics compiled for the Department of Communities and Local Government conclude fires in timber-framed dwellings are more likely to spread in completed homes and those under construction. The CLG report for the period April 2009 to March 2010 reveals there were a total of 400 fires on construction sites in the period, 50 of which were in timber frame buildings under construction. The report indicates that there is “a higher ratio of fires in timber frame buildings than those of other construction. Fires in timber-framed dwellings do tend to have a greater area of fire and heat damage than fires in dwellings of no special construction.” The report also said there had been 802 fires in fully completed timber framed buildings during the 12 month period. A recently published summary of work by the HSE in the construction sector confirms that the number of enforcement notices regarding fire safety has increased. Examination of the HSE Enforcement database shows almost 200 enforcement notices were issued by their inspectors on fire matters during 2010 (at 17 August 2010). Major construction site fires are “low probability/high consequence” events which have rarely led to human disaster on the scale feared. However, recent spectacular fires, particularly on timber-framed structures, have raised the profile of fire risk across all projects. The former building on this site, Beechdown Primary School, was also destroyed by fire on 23rd November 2000. Two 14 year old boys were subsequently charged with arson. At the request of their defence solicitors, they were tried separately at Winchester Crown Court. Each blamed the other and both were acquitted. BS5973:1993 is to be formally withdrawn by the end of 2010. First time buyers being frozen out of home ownership. Research by the National Housing Federation indicates that a whole generation is being excluded from the housing market as mortgage lenders demand ever higher deposits before granting a mortgage. Loan to value percentages are at their lowest ever; with some lenders requiring at least 25% of the purchase price as a deposit -a 150% increase over historic levels pre credit crunch of around 10%. Many first time buyers will not have saved a large enough deposit to buy until they reach 35, with those in London (52) and the south east (45) having to wait even longer before they can get on the property ladder. However, couples who save hard and delay starting a family will, on average, be able to buy their own home at 27 says the report. The July edition shows that the growth in new starts has significantly slowed in recent months and had been driven by the larger house builders. NHBC figures show that 102,300 new homes were started in the UK in the last 12 months compared with 82,250 new homes started in 2009. The NHBC report a rise in the number of new homes being registered by builders. In the period March to May 2010 a total of 32,352 new homes were registered, a 68% increase on the same period in 2009. HIPs are history: Eric Pickles suspends Home Information Packs with immediate effect. The Communities Secretary, Eric Pickles and Housing Minister Grant Shapps have announced that with immediate effect, they are suspending the requirement for homeowners to provide a Home Information Pack (HIP) when selling their homes. Mr Pickles today [20 May 2010] laid an Order suspending HIPs with immediate effect, pending primary legislation for their permanent abolition. In an effort to help reduce energy bills and tackle climate change, sellers will still be required to commission an Energy Performance Certificate before marketing their property. Whilst there is no longer a requirement to provide a HIP sellers can still provide one if they wish to do so. The continuing use of existing HIPs is also at the sellers discretion. BBC Watchdog programme highlights poor quality Persimmon Homes. BBC consumer programme Watchdog has received several complaints about the number of defects that buyers are finding in their newly built homes. Mr Arun Soni moved into his brand new Charles Church house in North London more than two years ago. Since then he says he's had hundreds of defects. These included large cracks, peeling paint on his front door and a leaking garage roof. Several of his heating and water pipes were not secured properly when the house was built so when they cool down at night they knock against the ceiling boarding. His builder has tried to fix the problem in several places but Arun is still having sleepless nights. "It's been an absolute nightmare. It's caused sleep deprivation for the whole family," Arun told the BBC. The latest house price index show house prices are increasing, although have to increase by an average of around 8.3% to be at the previous peak level. According to the Halifax, house prices rose 1.1% in March 2010 rising 5.2% higher than a year ago. Nationwide indicates house prices rose 1% and are 10.5% higher than a year ago. The Community Infrastructure Levy Regulations 2010 have been passed to replace the Section 106 planning agreements. With similar intentions to the previous system, it allows local authorities in England and Wales to raise funds from developers undertaking new building projects in their area. The money raised is then earmarked to fund infrastructure projects that may be required as a result of development. In his last budget before the General Election, Alistair Darling announced he was suspending Stamp Duty on properties sold for less than £250,000 for First Time Buyers only. This will apply from now to 25th March 2012. To fund this, stamp duty on homes selling for £1 million or more will attract a new 5% Stamp Duty from 6th April 2011. The new upper rate will affect between 10,000 to 15,000 home buyers every year. This code makes it mandatory for developers to reduce the carbon footprint and include such features as Bat boxes, water flow inhibitors and expensive heating systems. House builders believe this could easily increase the cost of a brand new home by up to £20,000. Opinion: Brand-newhomes.co.uk considers eco-policies as yet another burden on the new home buyer. From 1st April 2010, the new code sets out requirements that the builders of new homes which are covered by a new home warranty must meet. The purpose of the Code is to ensure that Home Buyers: are treated fairly; know what service levels to expect; are given reliable information upon which to make their decisions; and know how to access speedy, low-cost dispute-resolution arrangements if they are dissatisfied. Buying "off-plan" beware of the pitfalls! In a rising market, buying off-plan can be financially beneficial. See When to buy also. As the market rises the house you are selling increases in value, the house you are buying also rises in value but not in price, as the price is fixed at the time of Exchange of Contracts. This can be anything form six months or more before the home is finally built. During the current recession, many house builders put their operations on hold or slowed production, resulting in homes not being built as quickly as they may have done before the credit crunch. The Mail on Sunday reports one such builder, Berkeley Homes, has many off-plan home buyers caught in the trap with their new homes now completed, but worth up to 34% less than the time contracts were exchanged. They are nursing huge losses and are unable to obtain sufficient mortgage funds due to falling loan:value ratios and reduced lending throughout the market. These buyers are locked in a contract and whilst Berkeley say they are sympathetic to the plight now facing their off-plan buyers, they feel that a contract is a contract and are issuing court summons to buyers who cannot or refuse to complete their new home purchase. Condensing boilers in new homes unreliable in cold weather. The Daily Mail reports that the recent cold weather has increased the number of call outs for boiler breakdowns. British Gas had 100,000 boiler related call-outs before Christmas and HomeServe attended to 40,000 boiler failures, many of which were condensing boilers. Apparently, modern condensing boilers are prone to suffer from freezing of the waste pipe at the back of the boiler, which in turn causes the boiler to shut down often causing permanent damage to the boilers sensitive components. Around 8 million gas fired condensing boilers have been fitted in British homes since it became mandatory in April 2005. However, this type of boiler has a short working life generally of 3 to 6 years and after 4 years replacement is normally recommended if they suffer a breakdown. Condensing boilers have been fitted in all new homes built since 2005. For more on condensing boilers. By 2016 all new homes built in Britain will need to be “carbon-neutral”. At present, the Standard Assessment Procedure or SAP rating measures the energy efficiency of a new home. This is a standard test used to determine the energy efficiency of a particular design using a computer programme and laboratory results of measurements of the insulation properties of various building materials. The home itself is NOT tested. During the third quarter of 2010, new homes scored an average SAP rating of 79.3 out of a possible 100. In contrast, 40% of homes built before 1919 have a SAP rating of less than 40. However, a recent study shows that new homes are not as energy efficient as the SAP rating would indicate. Researchers at the Centre of the Built Environment at Leeds Metropolitan University have found that in a study of 16 new homes, the actual performance of the home was on average, the heat loss was 60% higher than the SAP rating suggested. The UK Green Buildings Council is lobbying the Government to introduce a new way of testing the actual heat loss in new homes not rely on the theoretical SAP rating. It is thought the test would add an extra £5,000 to the cost of building a new home. Following an internal review, Zurich has decided to exit the new-home warranty and building control markets. Zurich Building Guarantee will cease taking on new business, including the registration of new sites, with immediate effect. The insurer blamed the current decline in the new homes market and the economic downturn for its decision, stating it believed the area no longer represented a viable market. Zurich stated it will honour its existing commitments to customers and policy holders, with site inspections, building control activity, claims and queries. Insurers are becoming increasingly concerned by the additional fire risks associated with timber frame construction and are putting the quality of workmanship under scrutiny when assessing claims following fires in timber frame buildings. Insurer Brit Insurance has issued a writ to house builder Taylor Wimpey and their timber frame contractor, in a £2.6 million claim that is set to reach the courts. Brit Insurance alleges that the cavity fire barriers were either inadequately installed or missing. This case could be significant as it demonstrates that insurers are taking steps to limit their losses when fires cause disproportionate damage in badly built timber frame buildings. Dr Jim Glockling, the Fire Protection Association’s technical director and chair of a research group set up by the insurance industry, predicts there will be many more detailed inspections into whether buildings were constructed properly and if any failings in quality contributed to the extent of loss in a fire. He also suggested that when new timber frame buildings require insurance, if there is a suspicion the fire stopping measures may not be installed properly, a survey may be required before an insurer will provide cover. Fire experts say this is an example of timber frame construction being given closer examination by insurers and premiums are set to rise and in some cases insurance may be refused. HSE publishes new guidance for fire safety in construction. In the wake of several fires this year on sites using on timber frame construction, the HSE has wasted no time in revising their guidance notes for those managing and carrying out construction work involving a significant risk of fire. 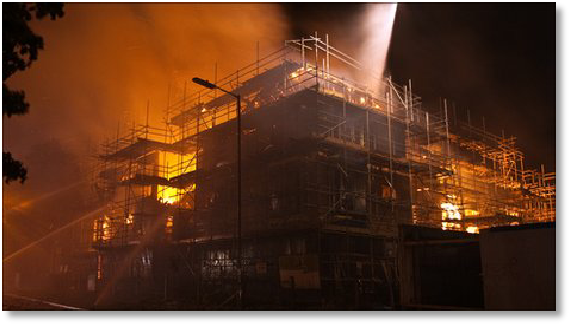 The new and detailed guidance specifically details the fire risks associated with timber frame construction and the precautions to be considered at the earliest possible stage of a timber frame project. Basingstoke building site fire. Three teenagers were arrested and later released on Police bail as part of an investigation into a huge blaze that destroyed a Castleoak building site in Gershwin Road, Basingstoke on Friday 10th September 2010. The £9.5 million project of 64 flats for over 60’s with care needs was the being constructed by Castleoak Care Partnerships, the Cardiff-based specialist care home building contractors. Castleoak’s client, Saxon Weald Housing Association, have released this statement CLICK. Fire-fighters were called at around 6.20pm on Friday night and battled with the fire until 10am Saturday morning. At stages up to 100 fireman from three counties battled the fire. Over 40 residents from nearby homes in Gershwin Road were evacuated overnight on fears the blaze would spread and the local ASDA was forced to close.